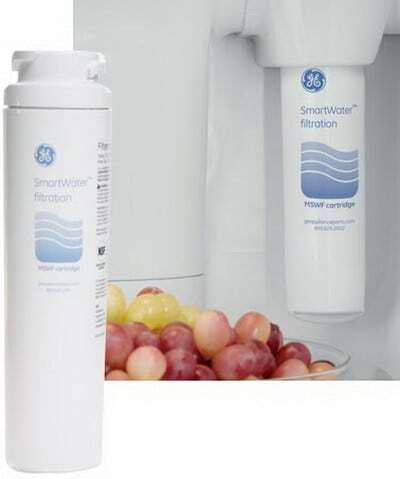 GE Refrigerator Water Filters – How Often Should I Change The Filter? I have a question about the water filter in my GE refrigerator. Is it every 3 months or 6 months? Can I change the filter myself? If so, how do I change the GE water filter if I have never done it? I am also unsure where the filter is located and which type my fridge uses. The water and ice on my GE refrigerator is starting to taste bad. Please help. 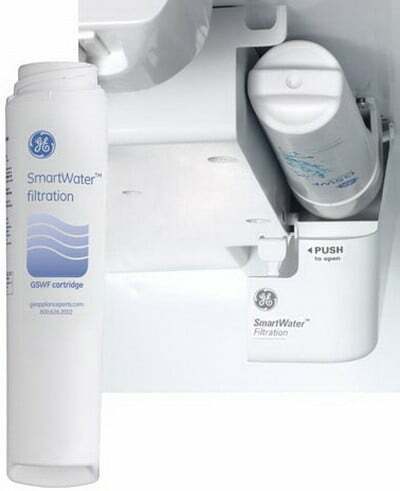 If you have a GE fridge in your home, you will need to replace the water filter eventually. The water filter cleans the water for the ice and the water. You may start to notice a strange taste in the ice cubes or the water. When this happens, replace the filter ASAP. There are many different types of GE refrigerators. When it is time for you to change the water filter, be sure you find the correct one that fits your fridge. GE makes side-by-side, top freezer, french door, swing-door bottom-freezer, french-door, and bottom-freezer refrigerators. Every 6 months or if the refrigerator has not been used for more than two weeks. If you notice the flow of water decreasing or strange tastes in the water or ice it should replaced. Almost all GE filters can be purchased at Lowe’s, GE, Walmart, and Amazon. 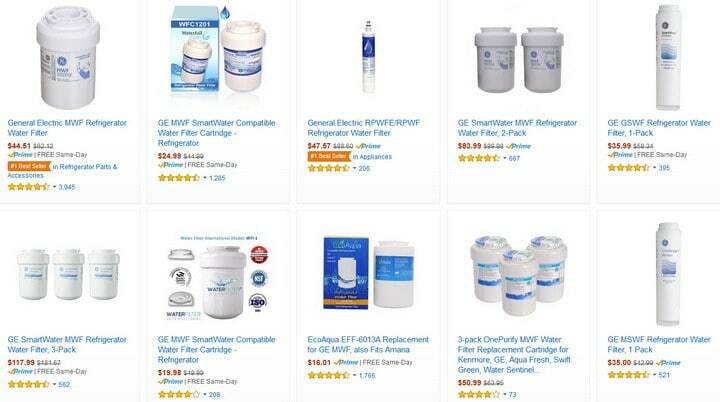 Do you need help finding the correct GE refrigerator water filter? 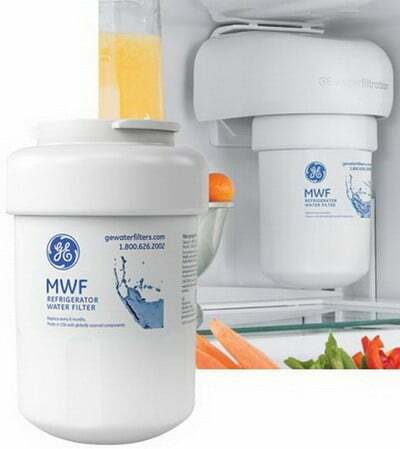 The MWF water filter is for GE side-by-side and french door bottom-freezer refrigerators. The MSWF filter is for GE side-by-side and french-door refrigerators. The GSWF filter is for GE top-freezer, french-door and swing-door bottom-freezer refrigerators. 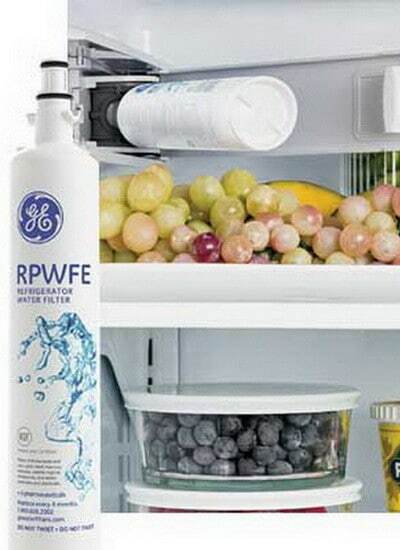 The RPWFE water filter is for select GE french door refrigerators. Also replaces RPWF in-the-door filters. Inline water filters are filters that are put “inline” with the water tube behind the fridge. This usually involves cutting the water line behind your fridge and adding the filter “inline”. 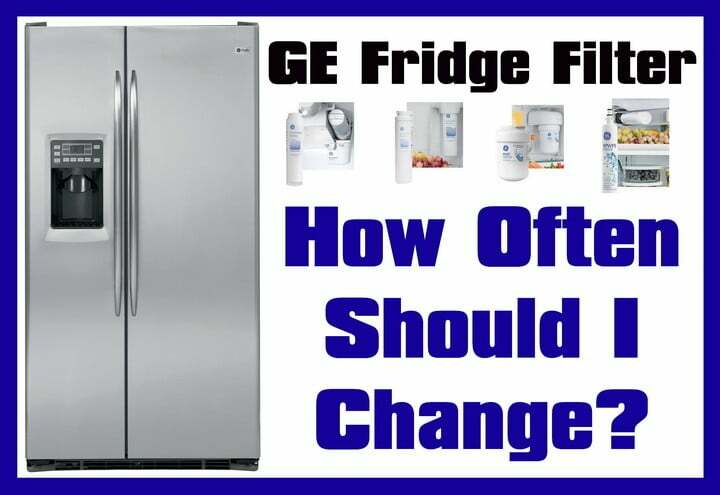 Do you have any other info on how often to change a GE refrigerator water filter and where to buy for less? Please leave a comment below. Next post: Maytag Refrigerator Water Filters – How Often To Replace Filter?